Another day, another eyeshadow palette review. I'll be the first to say, I've never really tried anything from it Cosmetics before, but when this showed up on my doorstep I was definitely intrigued. 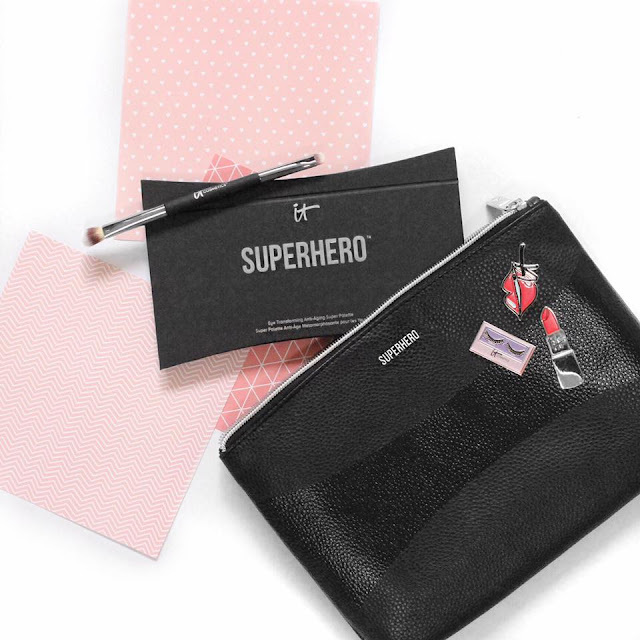 Keep reading on if you want to see some swatches and here what I think of the brand new it Cosmetics Superhero Palette*! 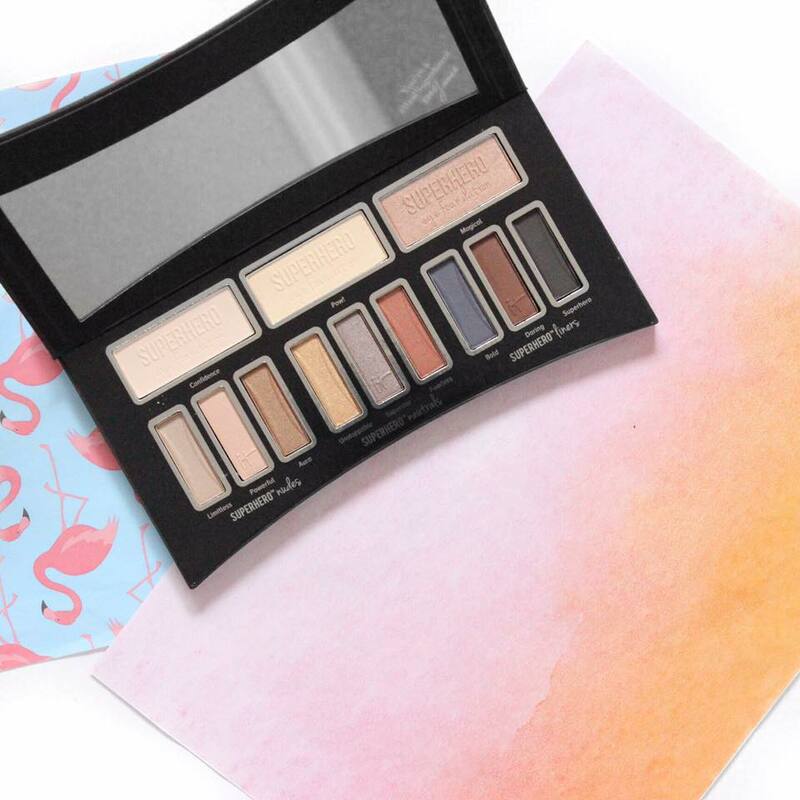 The Superhero palette is another neutral palette to add to you collection. It features 3 larger pans called "Eye Foundations" which are meant to correct, neutralise and smooth your eyelids. Below the larger pans, there are 9 more smaller shades, split into 3 segments of Nudes, Neutrals and Liners. Nudes are the lightest of tones for a simple "no-makeup" look, Neutrals have a bit more kick and a bit more reflect in the shades and Liners are the darkest, obviously to be used to line your eyes. Reading the instructions of the palette, they say to start with an Eye Foundation shade and then 1-2 Nudes or Neutral shades, followed by your Liner shade of choice smoked out around the lashline. 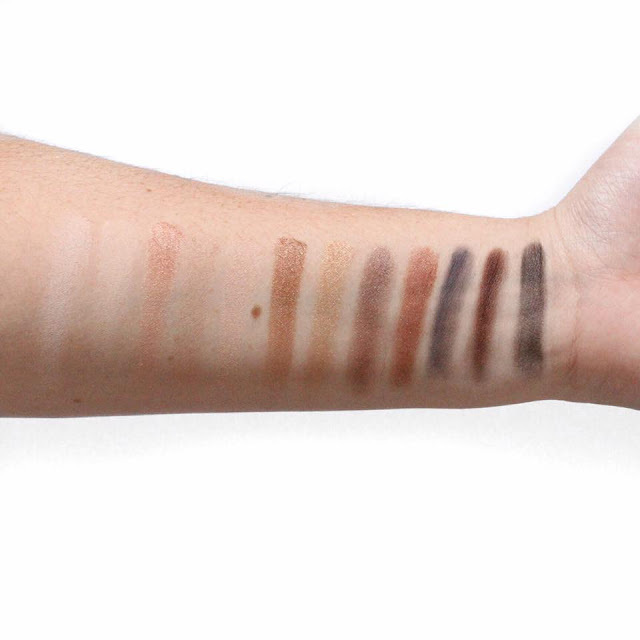 In the swatches above, the first three are the Eye Foundations, followed by the Nudes, then the Neutrals and finally the Liners. A completely matte, slightly pink cream shade. Extremely pigmented, smooth and blendable. A completely matte, yellow toned cream shade. Similar to Confidence and is extremely brightening. A rose gold shade, slightly shimmering but without heavy chunky glitter. More of a sheen vibe. A gorgeous all-over lid shade. A satin taupe shade. This one feels quite dry and is not as pigmented as other shades. A slightly lighter tone version of Magical, but with similar rose gold undertones. A gorgeous warm bronze with a subtle sheen. This would be perfect for an all-over brown smokey. A metallic gold. This one also feels quite dry, but still packs a decent amount of pigment. A mauve, taupe metallic shade with purple undertones. I find the metallic edge of this shade does buff away a fair bit in the blending process. A rust red metallic shade. This is definitely one of my favourite colours in the entire palette, because girl you know I love a good warm eye. An interesting shade in the palette, Bold is a deep navy shade. This would be an easy way to add a little colour into your eye look. This shade is pigmented but can pull a little patchy. A rich, warm brown shade. Perfect for a natural smokey kind of look. This is pigmented and a lot smoother than Bold. This the black of the palette, and whilst it isn't the worst black I've ever tried, its not my favourite. It feels a bit too powdery and is a little patchy and "grey". Overall, I don't mind the palette and I like the concept and I'm definitely going to try and incorporate this into my eyeshadow routine in future because I quite like a lot of the shades. Have you tried much from it Cosmetics before? What are your top picks? The palette looks nice! I haven't tried their eyeshadows, but I do like their brow products.